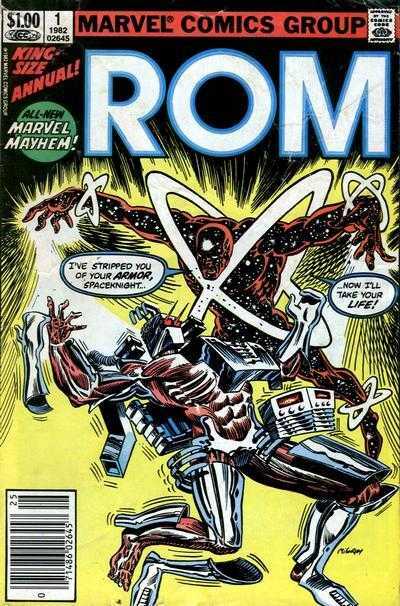 The first annual of Rom’s ongoing series presents two stories, both somewhat unoriginal in theme, but features content that is written and drawn quite well. The lead story by Bill Mantlo and Pat Broderick finds an alien come to Earth who was once part of a larger community, a hive-mind in nature. Now separated and alone, it seeks companionship and as such, starts absorbing the life force from children. Things take place and when Rom comes to help out; the townspeople mistakenly think he is responsible. The second tale by Steven Grant and Greg LaRocque sees a tale of treachery, betrayal and redemption from Rom’s past. Both stories are enjoyable and feature a lot of action and drama, but it is the second tale that is the more enjoyable one this time around, strange though it might seem. Usually Mantlo is on top of his game, but in this one instance, the tale that is not written by him is the one that is more exciting, even though it is something we have seen before, specifically calling to mind those stories involving Terminator, Rom’s fellow Spaceknight. This second tale involves Rom’s compatriot Gloriole, a man who also wants to do right by his people and he thinks that he can do so by allying himself with the Wraiths. He explains himself by saying that it is to learn the secrets of their sorcery, for once the Spaceknights know of it and how to use it, they will finally be able to defeat the Wraiths once and for all. The cost of doing that business though is to sacrifice Rom, but it would be a cost that could damn Gloriole forever. One of the best things about Rom is that his book always has our hero, among others, facing moral quandaries. It humanizes our cyborg hero and makes him relatable, more so than if these were just simple tales of good guys against bad guys. The great thing is, you know there is always a good time to be had when you read a comic featuring Rom.